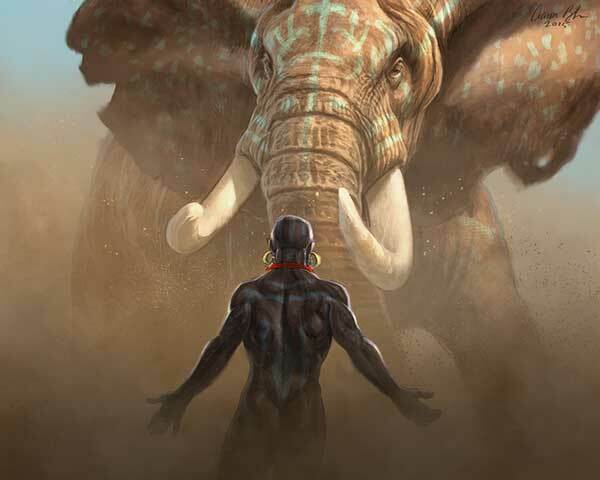 Great art happens when you embrace great innovations. If you have a passion for art, you’ve probably already spent years discovering just what you can do with a pencil and some paper. So why would you want an art graphics drawing tablet? It may be time to upgrade to a good drawing tablet to see exactly how far you can go next. Many people are surprised to discover that an art tablet is just as intuitive to use as pen and paper. 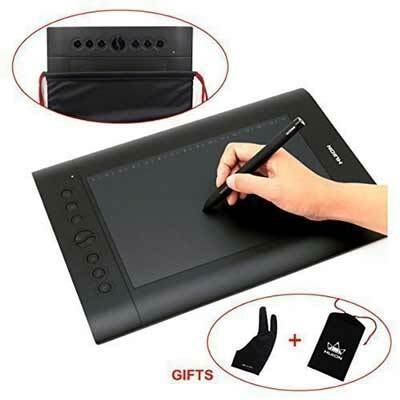 In addition, it is actually a lot easier than you think to find a cheap graphics tablet that actually has the features you need. Drawing tablets are really changing the game when it comes to how art is created. It is necessary to at least dabble in the practice of using a tablet to create art if you want to stay competitive and relevant in the field. Of course, there’s a really good chance you just might fall in love with the way a tablet allows you to express your creative skills in new and exciting ways that pen and paper never quite could. Are you ready to begin your search for a new tablet? Take some time to learn about what’s available out there right now. What Is a Graphics Drawing Tablet? You may have heard other artists talking about drawing tablets. Many high-profile cartoonists have actually switched to tablets in recent years. In addition, tablets are popular with art students around the world. You may be wondering exactly how an art tablet works. Will you be able to keep the same amount of control over what you create? An art tablet offers everything you already love about traditional methods with the added bonus of bringing you into the digital age. There are actually two types of tablets that people are referring to when they talk about drawing tablets. One version allows you to draw on the screen and control your hand’s movements directly on your tablet. The second method actually allows you to draw off screen using a pad that’s linked to a computer monitor. 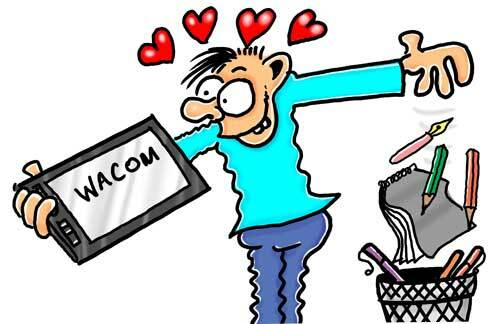 Wacom Mobile Studiopro 13″ and 16″ – The Rolls Royce of direct pen on screen graphics tablets. This tablet by Wacom has truly changed the game when it comes to how artists interact with their canvases. This high-powered model is a necessity for any art professional. But it comes at a price. This is a high spec’ and high priced tablet but it is very good. I have had the 16″ 512Gb model for around 9 months. It was a purchase I put off several times simply because of the hefty price tag. I went through all sorts of guilt trips thinking what else I could have spent the money on. However! – it has increased my output and is such a joy to use that it has paid for itself already. My workflow has rocketed and I would buy it again in a heartbeat! Of course, it also offers opportunities for amateurs to develop their skills and reach professionals levels. Users can’t help but love a pen that responds to the softest touch with multiple express keys placed well out of the way of the drawing surface. With the additional floating menu, it can be easily customized to your exact requirements. It’s fast very responsive and smooth as silk to draw on. 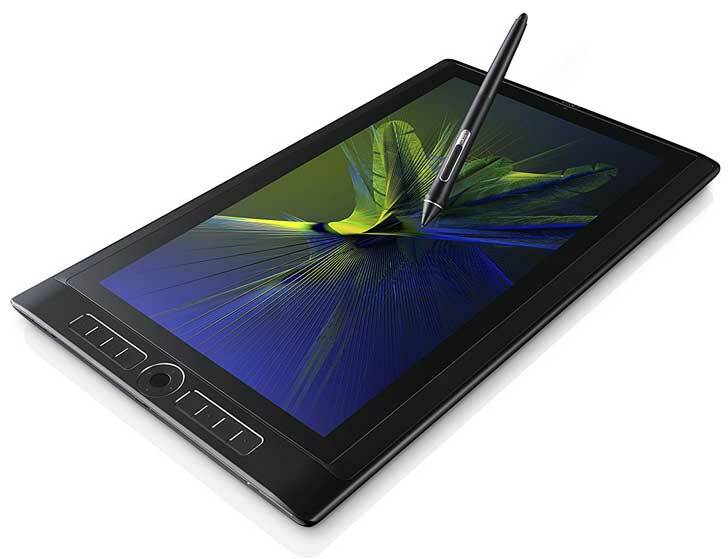 This tablet gives you the ability to edit large images or create 3D animation and sculpting. You can also run some pretty powerful applications with ease. This tablet comes preloaded with Windows 10 as standard and there is a basic drawing package included. The mobile Studiopro range is compatible with most graphics software packages. The downside is definitely the cost which may take your breath away. The box includes the charger and pen but does not come with a carry case or stand which I thought for the price a little disappointing. The Wacom Mobile Studiopro range succeeds in combining the latest and greatest upgrades in the world of technology with the traditional features artists need to be creative and productive. If you can afford one you will not be disappointed. If you value the ability to use your normal computer monitor when working on drawings, graphics, and art, this table is a great option. You can create images that link directly to your computer. You’re sure to find that the way you can use your fingers to navigate, scroll and zoom creates a very natural and intuitive experience. The tablet actually works by replacing your mouse. It also comes with a pen that gives you the ability to create thicker and thinner lines depending on how much pressure you apply. This tablet comes with drawing and paint software, tutorials and a Shutterfly photo album. If you’re looking for a tablet that falls on the affordable end of the spectrum, Huion offers something really terrific. You can look forward to a large drawing surface with a textured feel that mimics the feel of grained paper. This truly is a tablet for old-school artists looking to upgrade to the digital world without giving up control over how they create images. The fact that this model is extremely thin and lightweight means that it is a perfect option if you need a tablet you can take to work, school, libraries or coffee shops. This tablet comes with a special black glove that helps to reduce friction between your hand and the tablet’s surface. In addition, you’ll receive a black carrying bag that protects the tablet against scrapes. Ugee offers a tablet that provides a comfortable balance between splurging and going for the cheapest option available. Enjoy 19 inches of space to create your masterpieces when you use this impressive tablet. It comes with a battery-free pen that responds beautifully to pressure. This tablet also comes with a stand that helps to prevent the screen from shaking. 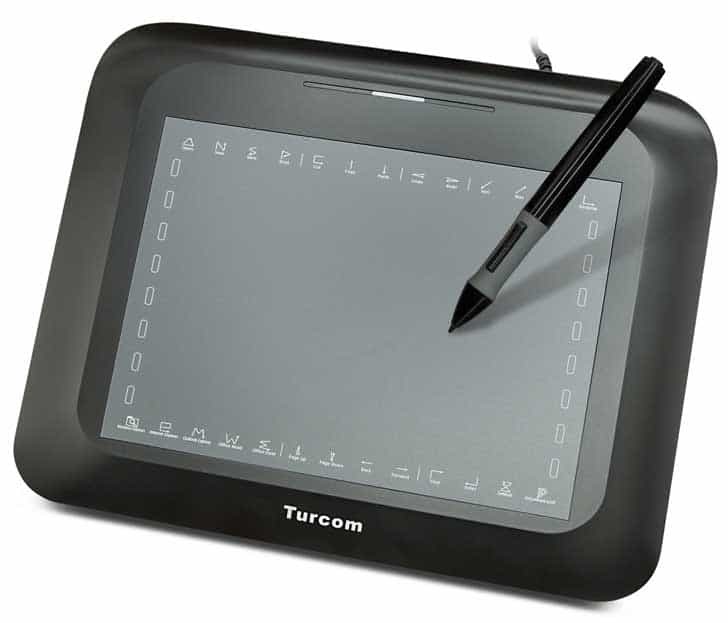 Turcom’s simplistic, hassle-free tablet is an ideal choice for anyone looking to get their toes wet in the digital world without making a huge commitment. This is a great option for students and professionals. You can use this tablet by replacing your standard mouse and transforming your computer into a drawing canvas. The active area (drawing area) is 8′ x 6″ making the tablet highly portable and takes up very little space which is a huge plus when space is at a premium. This tablet is notable because it offers the natural feel of a pen on paper. A pressure-sensitive pen makes it easy to bring your vision to life on your computer screen without giving up the control you’re so used to having when working with pens and pencils. Which Art Graphics Drawing Tablet is Right For You? This will depend on your personal choice, budget, and style of art amongst other factors. 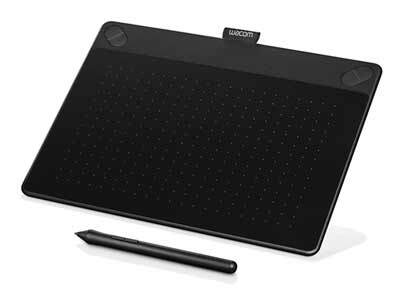 If you are new to graphics tablets and want to test the water the Wacom Intuos Art Pen and Touch Digital Graphics, Drawing & Painting Tablet Medium is a great package with software included and at a price that is very reasonable for such a high-quality brand as Wacom. If you don’t mind spending a bit more and would rather a direct draw art graphics drawing tablet the Ugee 1910B Digital Pen Tablet is a fabulous tool with a large 19″ screen. Whichever you choose, your artwork can only benefit from the amazing technology that has developed in art graphics drawing tablets. This gives you automatic entry to our regular competition draws - the newsletter will only be issued once or twice a month - thanks for signing up! Your email address remains confidential & you can unsubscribe at any time.